Published: Sept. 12, 2018 at 04:21 p.m. In Week 1 of the 2018 NFL season, cheerleaders around the league performed on the field and on the sidelines. Take a look at some snapshots of the best cheerleader performances. New Orleans Saints cheerleader Jesse Hernandez, a member of the Saintsations, dances in the first half of an NFL football game against the Tampa Bay Buccaneers in New Orleans, Sunday, Sept. 9, 2018. Minnesota Vikings cheerleaders perform prior to an NFL football game against the San Francisco 49ers on Sunday, Sept. 9, 2018 in Minneapolis. Minnesota won 24-16. An Indianapolis Colts cheerleader performs during the first half of an NFL football game against the Cincinnati Bengals in Indianapolis, Sunday, Sept. 9, 2018. A Los Angeles Chargers cheerleader performs during the first half of an NFL football game against the Kansas City Chiefs Sunday, Sept. 9, 2018, in Carson, Calif.
Philadelphia Eagles cheerleaders perform during an NFL football game between the Philadelphia Eagles and the Atlanta Falcons Thursday, Sept. 6, 2018, in Philadelphia. 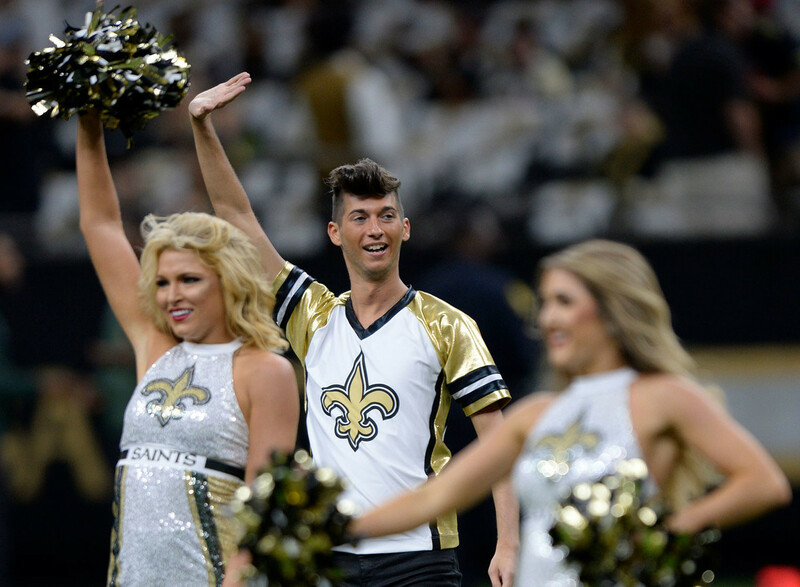 New Orleans Saints cheerleader Jesse Hernandez, center, a member of the Saintsations, dances in the first half of an NFL football game against the Tampa Bay Buccaneers in New Orleans, Sunday, Sept. 9, 2018. A Miami Dolphins cheerleader performs during the second half of an NFL football game against the Tennessee Titans, Sunday, Sept. 9, 2018, in Miami Gardens, Fla.
New England Patriots cheerleaders perform during the first half of an NFL football game, Sunday, Sept. 9, 2018, in Foxborough, Mass. A Baltimore Ravens cheerleader smiles during the first half of an NFL football game between the Baltimore Ravens and the Buffalo Bills, Sunday, Sept. 9, 2018 in Baltimore. Oakland Raiders cheerleaders perform during the first half of an NFL football game against the Los Angeles Rams in Oakland, Calif., Monday, Sept. 10, 2018. The New England Patriots cheerleaders perform during the game against the Houston Texans Sunday September 9, 2018 in Foxboro, Mass.